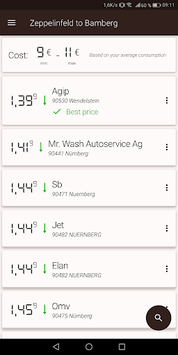 This app finds the best and cheapest gas stations in Germany for you. Everytime and everywhere - for free! Please note: Only gas prices from within Germany are available currently. Gasoline prices often differ up to 20 cent for Petrol Super 95, Petrol Super E10 and Diesel. Even within a range of 5 kilometers the price difference can be very high. Run a search an you'll see the best petrol station immediately. All prices are refreshed every 4 minutes. Thatfor you always know which petrol station offers the best price currently. The app offers a search for gas stations by a specific address, by your current location or along a specific route. No matter where you are or where you go - finding the best petrol station is easy and doesn't take long. Petrol stations can be marked as favorite, thatfor you don't even need to search for them. One click and all your favorite petrol stations come up on one screen. Ever wondered how much your car consumes? 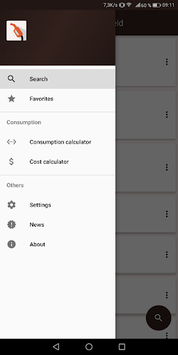 The built-in consumption calculator lets you easily calculate what your consumption since the last fillup was and how high your total average consumption of all time is. These consumption values are displayed in a nice chart to show you the exact development. Recognizing whether the usage increases, decreases or stays the same has never been so easy! 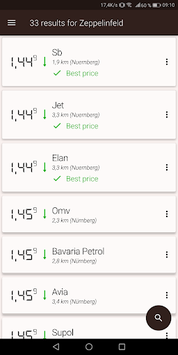 Fuel prices are provided by "Tankerkönig"
If you have any questions or suggestions, please don't hesitate to contact us. Your searches, favorite gas stations and consumption values are stored on your device only. No personal data is shared.